Some useful documents for parents of incoming 1st years are included below. The Behaviour Code, Acceptable Usage Policy and Concussion Protocol must be signed by parents and students before enrolment can be processed. Hard copies of these and forms for signing will be given to parents as part of a pack on Admissions Day in March. These should be handed in to the office on that day. The full text of the school’s enrolment policy is given on the Enrolment page here. The following is an excerpt from the sections on 1st year enrolment. Parents or guardians who wish to have their child(ren) considered for admission to the school as a first year student must complete a registration form on or before the closing date for applications. The registration process will begin and registration forms will be made available on the first Monday after the Summer holidays when prospective students are in 6th class in Primary school. The closing date for applications will coincide with the subsequent School Open Day and will be advertised in the local community. Applications received after the closing date will not be considered unless places remain unfilled following the offer of places to valid applicants. (Valid applicants are those whose application is received on or before the closing date). Late applicants may request to be added to the waiting list for consideration in these circumstances. Registration Forms may be obtained from the School Secretary, during office hours, over the enrolment period. Registration forms must be returned to the school office only by the parents/guardians of the applicant. Forms will be countersigned by the office staff and the parents/guardians, dated and timed. Receipt of the form will also be logged in the school office. The applicant (parent/guardian) will receive a carbon copy of the form which must be retained as proof of registration. In the event of any query, applicants will be required to produce the carbon copy. Other than those students already on the waiting list, operative until the new enrolment process has begun. Applications from students for places in 1st year will be considered as an application to transfer from another secondary school and will be handled under section 5 of the policy below. An Open Day will be held, and will be advertised in the local community and notified through local primary schools. Usually this Open day will take place early in November on a Saturday. A waiting list of applicants will be established after the process of allocation of places outlined in section 7 below has been followed. This waiting list will remain active until the new enrolment process begins. The Board of Management has amended the enrolment policy in relation to 1st year students as outlined in this section in response to the very significant changes in the enrolment policies and patterns of enrolment in the national schools in the Tralee area in the last few years. These changes have had a significant impact on the existing enrolment policy in Mounthawk to the point of rendering it unworkable. Consequently the changes in criteria outlined below have become necessary. The school reserves the right to continue to monitor the patterns of enrolment from the feeder national schools and amend this policy further at any time, if deemed necessary. 1st . Siblings of current students of Mounthawk and siblings of students who completed their post-primary education in Mounthawk, Balloonagh and Moyderwell Secondary Schools. 2nd . Children of staff members who are directly employed by the Board of Management on the date of enrolment and on the 1st of September of the student’s year of entry. 3rd . Students who have completed their education in the Mercy ethos of Balloonagh and Moyderwell Primary schools. 80% of the places remaining after the allocation of places under the 1st and 2nd criteria will be allocated to students in this category. The number of places will be allocated to each school in proportion to the number of applicants from each school. For each school, places will be allocated on the basis of number of years enrolled in the school, as follows: Places will be offered first to students who have spent 8 years on the DES roll for the school (i.e. from junior infants), next to those who have spent 7 years, 6 years down to those who have spent 1 year. In following this process, if and when at any point the number of applicants, with the same number of years in the school, exceeds the number of places remaining, these remaining places will be distributed by lottery among these students. Any remaining applicants who do not qualify for this lottery will be included under the 4th criterion. 4th. The remaining 20% of places will be allocated to all other applicants (including applicants from Balloonagh and Moyderwell who did not qualify for inclusion in the lottery under the 3rd criterion1) on the basis of a lottery among all the valid applicants. The random selection process (lottery) will be overseen by a panel appointed by the Board of Management consisting of a representative of the Board (the Principal), a representative of the Parents’ Council and an independent scrutineer appointed by the Board. The name of each student entitled to participate in this selection process will be placed in one of three containers as appropriate, (one container for each of the two schools under the 3rd criterion and one container for students under the 4th criterion). A member of the panel will draw names from each container, one by one, until the maximum number of places allocated for each school under criterion 3 and all the schools in under criterion 4 is reached. The order in which the names are drawn from each container will be recorded on a numbered list. Places will be offered in the order in which names are drawn from the container until the allotment of places in each category has been filled. The remaining names on each list (i.e. those students who have not received places in that category) will remain on a waiting list within the category and will be offered places in order should such places become available within the category. These waiting lists will remain in place until 30th September of the year of intake. Once students have been accepted into the school, they will be informed of the date of Admissions Day (normally in Feb/March). On this day students sit a standardised assessment test which is used in conjunction with the reports from the national schools to support students in their transition into 1st year. On this day also there is a talk for parents and an opportunity to finalise subject choice. 1st year students return to school a day before the other students so that it is possible to have an induction day when they are on their own in the school. On this day they have an opportunity to start to get to know the building and their classroom and new classmates. it is an important day in the transition process. They will also have the opportunity to meet with their Year Head and class tutor who have specific responsibility for supporting the 1st year students. For more on the Pastoral Care structures in the school click here. Mercy Mounthawk Secondary School has a long standing tradition of organizing a mentoring programme between 1st year students and 5th year students. 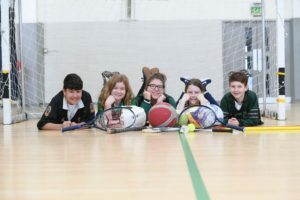 The aim of this mentoring programme is to endeavour to show incoming 1st years the ropes for secondary school and help them in their transition from primary school to secondary school. Each 1st year class is divided into two groups of 10-12 students and assigned two fifth year students. On the 1st year’s inaugural visit to the school in August, they are given a guided tour of the school by the 5th year mentors, and a few basic rules and guidelines are also outlined. After a training session with Ms Cronin, the fifth years begin to mentor their assigned groups. The fifth years meet with their 1st year groups once a week at lunchtime for the first term. The groups discuss various topics of relevance such as bullying, peer pressure and friendship. There is also an element of fun involved including quizzes and games, with the emphasis on interaction and teamwork. Shoes: Black leather shoes only (not trainers or boots, no logos or embellishments). Jacket: School fleece, jacket or blazer with school crest may be worn only. Navy polo shirt with school crest, available in school. Track suit bottom, navy or white, available in any sports shop.